It's been a long time since I shared a pattern from my collection so today, here's a pretty summery crochet pattern from the 1950s. I love the poodles on this darling vintage cardigan. That nipped in waist and 3/4 length sleeve is perfect to wear over your sun dresses or with a crisp cotton skirt! The pattern is for the basic cardigan, with no mention of how to make the poodles but I bet you could easily applique some felt cut-outs or purchase store bought poodles for Halloween poodle skirts. Super cute!! 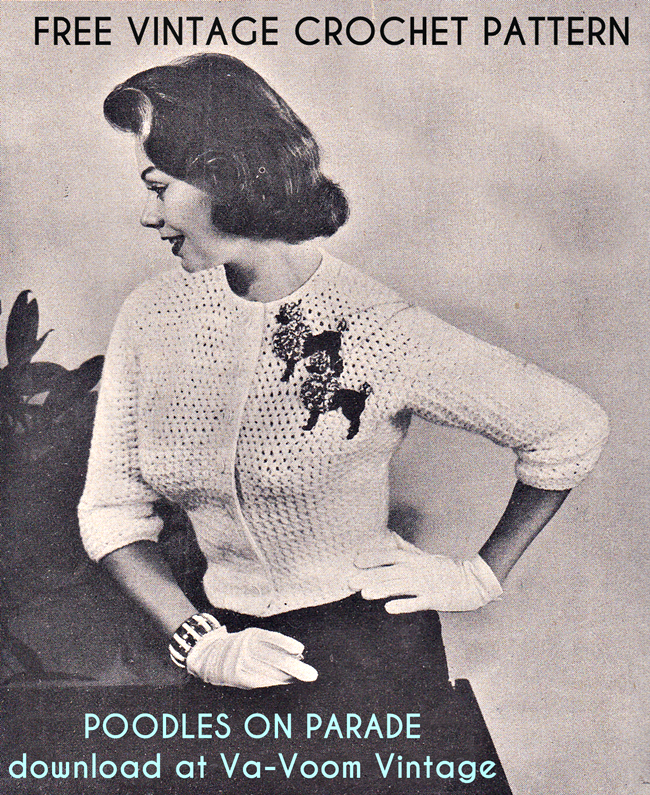 Download the Poodles on Parade free vintage crochet cardigan pattern from Dropbox. For more like this, check out my free vintage patterns page for vintage sewing, knitting and crochet patterns and free downloads page for e-guides, patterns and free vintage craft books. Enjoy! Fabulously cute!!! Thank you very much for sharing this darling pattern with us. One can never, ever have to many poodle themed items in their closet - or life in general - if you ask me.